After two long flights and a 9 hour layover in London, we've made it back home to Arizona and New Mexico. We wanted to give you one final blog post to wrap up our trip. Saturday morning we were so blessed to be able to experience a baptism service for four new believers from Hope Baptist Church. Keith and Fred both had the privilege of baptizing these four at the Sunnyside Swimming Pool. Fred also led us in Communion immediately following the baptisms. As Mona said, this was the cherry on top of an amazing week. To witness four young people publicly declare their newfound faith in Christ and celebrate with them and their families was such a joy. After the baptism service Keith decided he needed a trim at the roadside barber shop that we had passed all week on our way to and from HBC. There's a live video of all the action over on the church's Facebook page. Pastor Julius and Cintia met us at the airport in Johannesburg that afternoon to say our goodbyes (for now.) For me personally (and I think my teammates would agree), getting to witness firsthand the ministry that Julius and Cintia are doing, their burdened hearts for the lost people of Africa, their genuine kindness, humility, gratitude, and their passion for Jesus was the highlight of my time there. What a joy and a privilege to be partnering with people like them. I find myself wanting to be more like them because they look a lot like Jesus. Thank you all for your prayers and encouragement. We were comforted and emboldened knowing you were praying for and thinking of us. To God be the glory for all that was seen, heard, done, and experienced on our trip! We had another great day distributing eyeglasses in Soshanguve! We believe around 700 people came through the clinic between yesterday and today. We're grateful to God for bringing so many people. We were able to work more efficiently today because of some changes we made with the eyeglass testing process, so thank you to those of you who prayed specifically for that. 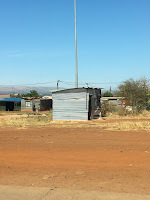 Here are a few more photos of the town of Soshanguve. You can see a photo of the "stand" that I mentioned in the last blog. Our understanding is that this is the shelter the government provides until the person or family is able to pay for a better/larger place to live. For about an hour at the clinic this morning I (Jamie) was able to help people who needed reading glasses find the right pair they needed. It was so fun to see how overjoyed they became when they put on the right pair of glasses and could actually read. People would raise their hands in the air with joy and give me a hug. How much we take for granted in the U.S. We have so so much. Today Mona prayed with a young lady who trusted in Christ for the first time. She had arrived at the community center (where the clinic was) at 4 a.m. to wait for glasses. As Mona said earlier.. she didn't know she was also waiting to be introduced to Jesus. So exciting! Several others made salvation decisions today - we're praising God for moving and choosing to use weak vessels like us in the work He's already doing. We're headed to bed early tonight because we'll be waking up at 2:30 a.m. to head to the game reserve tomorrow morning for some fun time together experiencing the African wild. We can't thank you enough for praying. As you continue, pray for all those who came through the clinic today, for those who made salvation decisions, for those who heard the Gospel and seeds were planted, for HBC to be diligent and faithful in following up with all of the contacts made, and beginning to disciple new believers. God is good! We are praising God today for new believers in Christ! We traveled about 40 minutes outside of Sunnyside today to a town called Soshanguve to distribute eyeglasses and sunglasses with volunteers from Hope Baptist Church (HBC). About 250 people came through the eyeglass clinic - all were prayed with and several heard the gospel, some for the first time. 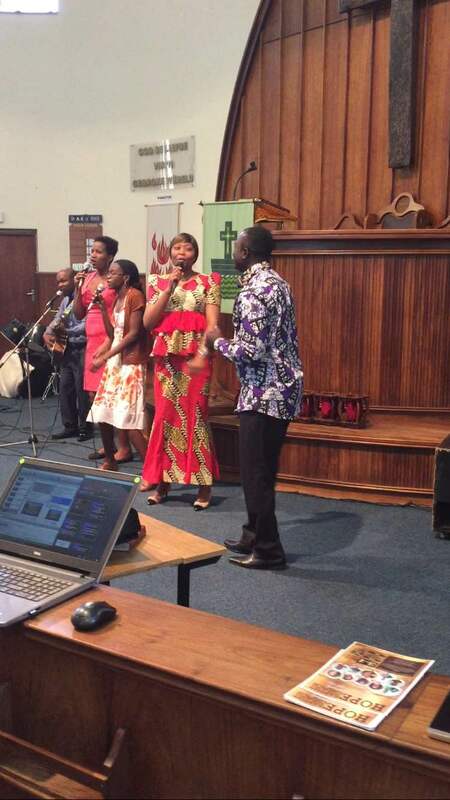 Soshanguve is where HBC recently planted a new church, which first began services this past April. 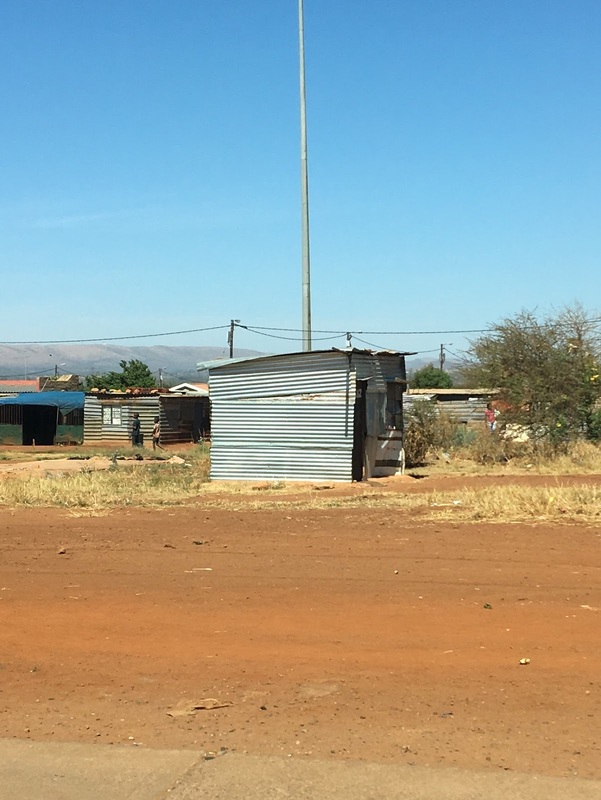 This town is still considered within Pretoria, but it is not as developed as Sunnyside. Many people live in "stands," which are basically about 12'x14' with tin walls. The need is very great. Devona spoke and prayed with a woman who was diagnosed with HIV yesterday. I spoke with a woman in the restroom who is sick with cancer. Fred spoke with a woman who fears for her children that are using drugs. Even though we hadn't planned to arrive until 9 a.m., we were told people began lining up outside the community center at 5 a.m. to make sure they were there to receive a used pair of glasses. What a humbling experience for us. Thankful to God that HBC has moved into this community and is beginning to connect with the people to share the hope we have in Jesus with them. We're still gathering the right numbers, but we know several people trusted Christ as their Savior today for the first time. So thankful and excited!! What a privilege to share the life-changing hope of Jesus with these people. We'll head back to the same place tomorrow to do another round of the clinic. We did have a few issues today with the efficiency of our system which caused a pretty major back up of people waiting to see the eye doctor. Pray that we'll be able to work out those kinks tomorrow in order to accommodate as many people as possible. Also pray for meaningful conversations and for us to be warm yet bold in our sharing. Thank you for this opportunity church family! Thankful for another great day. On a side note, how many men does it take to figure out how to pay for a parking garage ticket...? 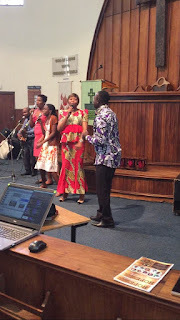 Day 4 - Last day of the conference + African celebration! ​Another full but amazing day here. Today was the second and final day of the community leadership conference put on by HBC. This morning we heard three really wonderful main conference sessions. 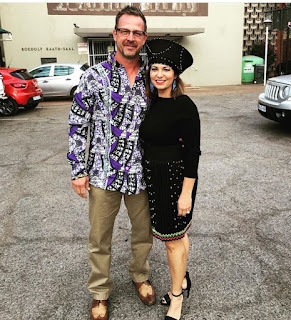 The first was from a local South African pastor named Jaco Strydom. We were all really moved by his presentation about living simply and living in community. The second was from our own Mona McDonald, who gave a powerful and practical message about caring for the children and youth in our community and about how God values life. Third and lastly Keith Matney ​spoke about worship and really connected with the audience through his message about worshiping in spirit and truth. What a blessing to sit under all of this wonderful teaching. After the main sessions we enjoyed another lunch made by ladies from HBC, and then went out to shop for some traditional African clothing to wear to the end-of-conference celebration tonight. Devona definitely won best-dressed! At the celebration our team was able to hand out certificates to each person who completed the conference. Where in the U.S. we might disregard a simple certificate of completion, they considered it such a high honor to receive them. They were so proud. Also, for the final portion of the celebration, we were honored to witness the graduation of two theology students through Hope Baptist Church. You can see by the formal graduation wear what a big deal this is. They were each given leather ESV Study Bibles and commissioned by Pastor Julius, Bishop Lawrence (the other man wearing red) and our teammate Pastor Fred. We discussed at dinner just how much we take education for granted in the U.S. It is much harder to come by in South Africa. They place high honor and high priority on education and training and that was evident tonight. Something we could learn from them. What a great day. Resting up to start eyeglass distribution tomorrow! Thank you again for your prayers - we need them! We made it through the first day of the leadership conference at HBC! Thank you for your prayers! We needed them and felt them. The day was full (8 a.m. - 6 p.m.) with three main conference sessions in the morning plus a worship time, then lunch, then two hours of workshops then a final main session. Our team and the team of volunteers from HBC are worn out, but it is evident that the pastors and community leaders that are attending the conference are engaging with the speakers, asking good questions, and participating. This morning our team members from New Mexico, Fred and Ken, led a main session on "leading with integrity," then Doug and Devona Haws led a main session on "God's blueprint for marriage." Some of the ladies from HBC fixed lunch for all the conference participants and volunteers. And then most of us led afternoon workshop classes. It was a really great day of learning, worship, and fellowship with one another. Most of us are pretty relieved that our teaching responsibilities are over for the week, although Mona and Keith still present main sessions tomorrow morning. Be in prayer for them as they prepare and present. One of the great privileges of today was being able to listen to Thokozile Zulu (pictured below) speak about her job working for the South African government during one of the main conference sessions. She is a young, strong believer in the Lord and has over 600 employees under her management in her position with the government. She is passionate about believers stepping up into areas of influence in society in order to impact the community for Christ. She was an inspiration to all of us. We ended today's portion of the conference with a very powerful time in prayer led by Pastor Julius. We prayed that Sunnyside, Pretoria, South Africa, and Africa would be changed by the love of Christ, and that God would raise up strong Christian community leaders to help enact that change. Thank you again for praying for us. Everyone on our team is doing well. We love you and are proud to represent you here in SA. 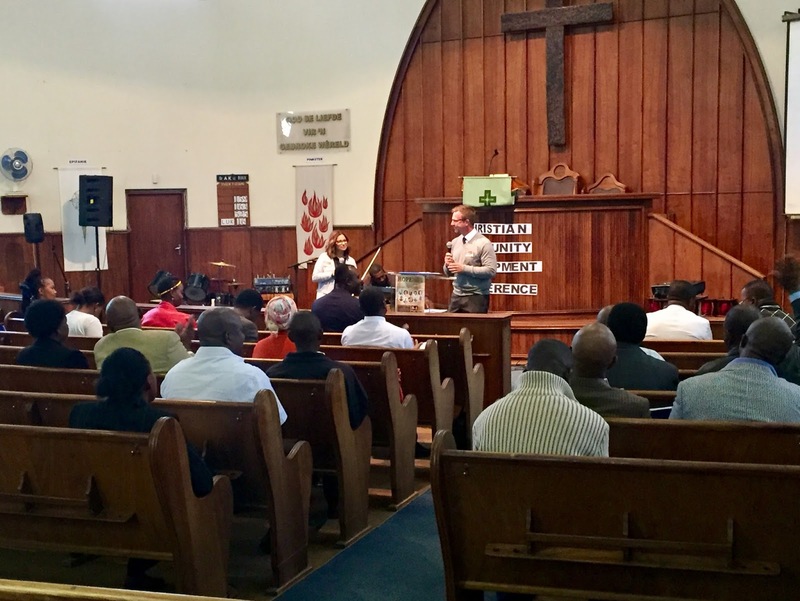 We've come to the end of our second full day here in Pretoria, and we feel so grateful to be just a small, small part of what God is doing through Julius, Cintia and Hope Baptist Church. When we arrived at HBC this morning for the service, we went out to the main street near the church and spent about 20 minutes handing out flyers to promote the leadership conference this week. We then got to enjoy the HBC service as Cintia helped lead in worship and one of our team members, Fred, gave the message. After lunch our team came back to our B&B and sorted glasses in preparation for the eyeglass distribution this Wednesday and Thursday that will be held in a town called Soshanguve, about 30 minutes from Sunnyside where HBC has planted a new church. This evening we spent some time with Julius and Cintia so they could share with us the story of how Hope Baptist Church came to be, their vision for the future, and current struggles and joys. It is so evident that this couple is passionate about and committed to seeing the people of Sunnyside, Pretoria, South Africa and beyond be changed by the Gospel. Their sacrifice and burden for their country moved each of us in significant ways. It's a privilege to know them, and they truly exemplify the character of Jesus. We made it! We're all exhausted and about to hit the sack, but so glad to finally be in Pretoria. We've had quite the travel experience, but already been moved by God's faithfulness and provision. 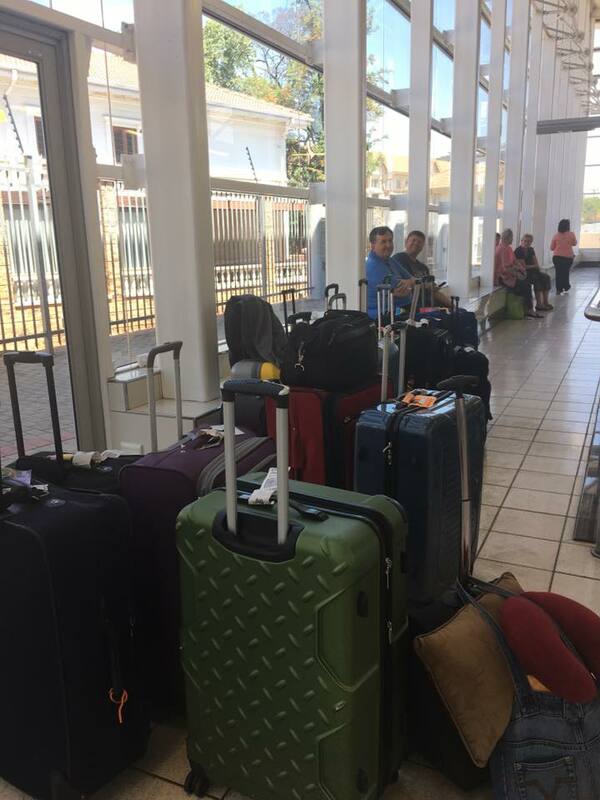 After two long flights, a layover, and a lengthy customs line, we were all ready to get on a train toward Pretoria but were stopped by customs and held up for quite a while because of an issue with the eyeglasses we brought to use as a ministry outreach later this week. It wasn't looking good that we would get through with the glasses, but we each began to pray and it seemed as though the customs agents suddenly decided to change their minds and allow us in with the glasses. Thanks to those of you who were praying around 8:30 - 10:00 a.m. SA time (11:30 p.m. - 1 a.m. AZ time) - know that your prayers helped during that stressful time. We were so glad to finally meet up with Julius at the Union Building (capitol building with government offices). He told us a little about Pretoria as we overlooked the city. 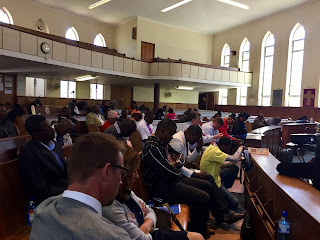 We then took some time to pray with him for Pretoria, for the conference this week, and for him and Cintia. Then we all headed to Hope Baptist Church for those of us who hadn't seen it yet. We met Cintia there who was preparing for Sunday worship the next day. So good to be with Julius and Cintia, what hospitable and warm people. They took us to the outside of the church to see a large poster they've hung with our names and pictures promoting the conference. Below is our group with Julius, Cintia and a few kids from the church in front of the poster. Thank you for praying. Please continue! We're grateful for God's faithfulness and so excited to see what He has in store for this week. We all made it together to the airport and are taking off in about 30 minutes! We'll post again once we arrive in Pretoria. Thank you for your prayers! Hi church family! We're so grateful you're joining in on this journey with us as our sixth team heads to Pretoria, South Africa this Thursday evening (Sept. 29) We'll be updating this blog with information and photos each day of our trip so we can share with you all that God allows us to be part of while in Pretoria serving with Hope Baptist Church. Our team has our final preparation meeting tonight before we meet at the airport on Thursday! Our preparation meetings over the last couple months have been a little bit of an adventure as our entire team has yet to all be in the same physical place at one time. We're so excited that in addition to our team of five from FSBCS, two others will be joining us — Fred MacDonald is the Director of Missions at the Pecos Valley Baptist Association in Artesia, NM, and Ken Engledow is the Senior Pastor at Hillcrest Baptist Church in Carlsbad, NM. It's been a pleasure getting to know these men during our meetings, and we're looking forward to meeting them in person! Here's a photo of our computer screen during one of our recent meetings - you can see we have four different locations represented at the top of the screen. I think we're all experiencing a combination of excitement and a little nervousness as we each prepare to teach main sessions and/or workshops during the Hope Baptist Church leadership conference that we're assisting with this coming Monday and Tuesday. We'll also be helping with another eyeglass distribution (as teams have done in the past) on Wednesday and Thursday. We need and appreciate your prayers. Pray that our nerves about teaching will be settled and that we will trust the Holy Spirit to speak through us and use our teaching for God's glory and for the good of those who hear it. Pray that we'll be a great encouragement to Pastor Julius and Cintia and to the HBC body of believers. Pray that God's name would be lifted high and that many people would come to be in relationship with Him. As we've said many times in our preparation meetings, God doesn't need us to accomplish anything in Pretoria. But He allows us the privilege of being a small part of what He's already doing. We're grateful and excited. Team #6 Prepares to Leave for South Africa! 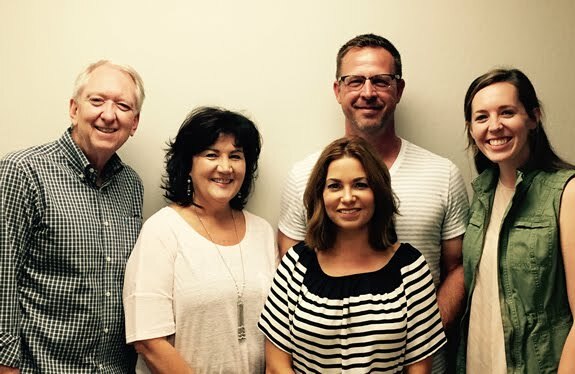 Our next mission team from First Southern Scottsdale is preparing to leave for Pretoria, South Africa on September 29th. Check back to this blog from now through the duration of the trip as they return on October 9th. Your prayers and support are greatly needed and appreciated for this team!